Luke Haigh produced a man-of-the-match performance as Thornhill earned an impressive win at Askam. Thornhill Trojans shrugged off their recent poor form to turn on the style with a 43-22 win at Askam in National Conference Division Two last Saturday. It was a performance to savour from the Trojans, who headed on the long trip home full of optimism for the remainder of the season. Man-of-the-match Luke Haigh produced a master class in attacking rugby as he scored a try and had a hand in most of the others. Joss Ratcliife also stood out with an assured performance bagging two tries in an outstanding team performance. The only blip on this fine afternoon was an injury to Askam winger Ethan Guy, which resulted in play been held up for 20 minutes when an ambulance was called. Guy was taken to hospital where X-rays revealed a broken tibia and fibia. Thornhill capitalised on early pressure when Anthony Harris surged for the line and grounded the ball despite the attention of several defenders. Sam Ratcliffe converted. With the strong wind behind them Askam responded by creating an overlap which saw Guy squeeze in at the corner, despite a last ditch tackle from Ryan Fenton. Haigh broke from acting half back and sent Joss Ratcliffe over for a try that Sam Ratcliffe converted. A downpour caused Thornhill to lose their focus and Sam Dowsett forced his way over for an Askam try. Dan Sayle converted to reduce the lead to two points at half-time. Thornhill dominated at the start of the second half as Haigh took the ball forward and Jake Wilson finished the attack by crossing for a try, which Sam Ratcliffe converted. An Andrew Bates kick rebounded off an Askam player into his path and he regathered to nip over a try. Sam Ratcliffe converted. Askam tried to battle back but great defensive work from Thornhill forced the ball to be spilled on the try line. The defining moment came when Joss Ratcliffe scored a brilliant try. Deep in Thornhill’s half, Joss Ratcliffe put Sam Ratcliffe on a run down the wing. The ball was returned to Joss Ratcliffe who powered forward before kicking ahead. George Stott collected and put Joss Ratcliffe over for a try. Sam Ratcliffe added the goal. Everyone was then abruptly brought back down to earth with the injury to Guy. Once play restarted, Liam Morley put over a drop goal for Thornhill but then the visitors seemed to lose their focus as Askam fought back with Gary Bolton scoring and Dan Sayle converted. Missed tackles from Thornhill then presented Tom Wilkinson with the chance to dive over between the posts. Sayle converted. Any concerns that Thornhill may have totally switched off were banished when man of the moment Haigh again came up with the magic touch. Haigh went on another one of his trademark runs from acting half-back to catch Askam napping and score a try that Sam Ratcliffe improved with the boot. In the final act of the game Sam Ratcliffe gained possession and stepped over for the final try, which he converted to give him a 100 per-cent success rate. 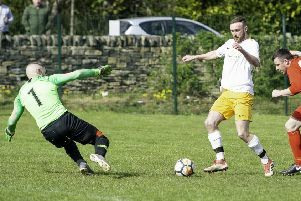 Victory leaves Thornhill fifth in the table but just a point behind Saddleworth Rangers.